WILLEMSTAD – The Curaçao Tourist Board (CTB) visited the public beaches today in the Banda Bou area to assess the situation after Hurricane Matthew and also the south-west winds Curaçao was confronted with this morning. Authorities have closed the access to several public beaches in the Banda Bou area seeing the situation. 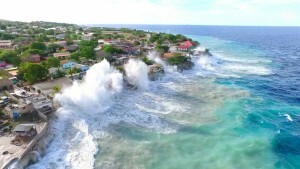 High waves have done a lot of damage to the beaches. An analysis of the situation indicates that there is a lot of work to be done to have the beaches back to the state they were before the storm. The beaches are not the responsibility of the CTB. For this reason, CTB will contact the responsible departments to coordinate the project to clean and repair the beaches. This process should start immediately seeing that the beaches are very crucial for the tourism industry. It is one of the products Curaçao has to offer to its visitors.